I have spent a lot of time living in small spaces and have grown to love furniture and other items that serve more than one purpose. From ADDI Design Group comes the Piano. The Piano is a bench that doubles as a bike rack...or a bike rack that doubles as a bench, depending on how you look at it! It resembles, but is far more sophisticated, than the wood pallet bike rack we featured a while back. If you have created a unique bike storage solution let us know. Truing wheels isn't the same as building wheels. 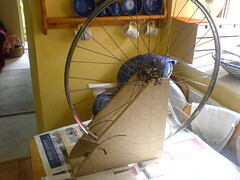 Similar equipment is used, but wheelbuilding is more labor intensive and requires some specialized stuff. Truing up an already-built wheel, however, doesn't have to be scary (though you'll probably make your wheel worse the first time you mess with it. Tip: tighten less). It helps to have a dedicated truing stand. You can certainly buy a truing stand that will serve you well. But since this is such an occasional task, and since you probably have the right materials laying around, you might as well trying building your own first. Here are 7 decent looking truing stands that you can build on your own, materials and desired sophistication will determine cost. Drop the fork into the vise, then mount your wheel on the outsideof the fork. Use a zip tie as a visual aid (or, do like the originator of this hack and use a screwdriver and a steady hand). This next wooden truing stand is pretty sweet, and elegant to boot. AAron at AAKT was inspired by Roger Musson's wheelbuilding ebook. It is pretty to look at and it would be hard to duplicate the elegance, but a hacker could come up with a uglier model that would likely function just as well. As usual, instructables.com comes through. This guide to building your own truing stand is nice because it's mainly metal parts. It's made for precision, but the downside is that you've got to actually buy a cheap truing stand first, then modify it for higher tolerances. Here's another wooden truing stand, with multiple photos. I think this might be a favorite of mine, but the pics are kinda grainy. Bummer. The design is pretty elaborate, with some general instructions for the build. Again, this is probably best used for inspiration as opposed to an exact copy. And yet one more truing stand made of wood. This one has the simplest design of all the wood versions, but once again, no explicit instructions for the build. You'll have to examine the large picture to get a sense of what's going on. The next two stands were featured on Bike Hacks in the past. Toby from Tennessee submitted a stand built from part of a fork. Rob from Australia created a stand from the backend of a scrap large-size frame using a hacksaw and angle-grinder. If you have built your own stand and would like to have it featured let us know.